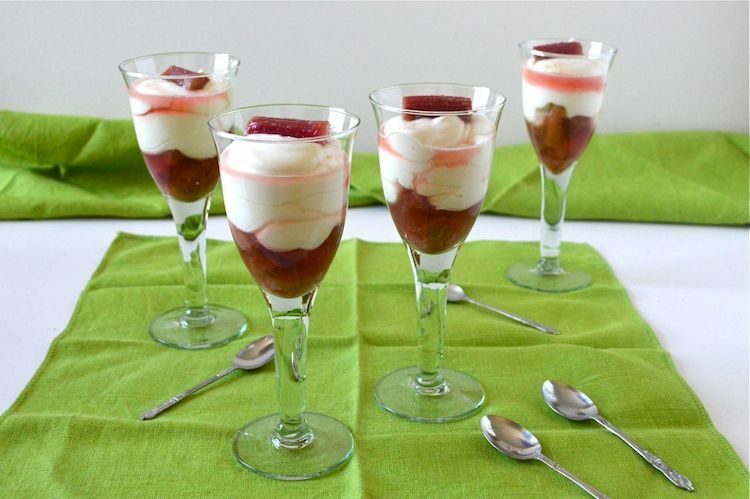 When I posted a picture of this Champagne syllabub with orange rhubarb compote over on Instagram I was overwhelmed by the chorus of ” there’s no such thing as leftover Champagne”. Hmmm! CT and I don’t drink a lot and obviously nor do our friends. We had a little bit leftover from a birthday brunch and I’m so glad we did. These little pots of deliciousness are both luxurious and totally sumptuous. Last Sunday I had a fabulous and much needed day out. I finally managed to take my mother to Caerhays Castle to see the magnolias in full bloom. The display was stunning, but to paraphrase an oriental sage, the heart doesn’t crave flowers for long when the belly lacks calories. Thankfully, when I dropped her off back home, I was treated to a bowl of homemade soup, followed by a good look around the garden and a post-prandial raid on the rhubarb patch. The result is this toothsome rustic rhubarb galette with orange spelt flaky pastry. A rose by any other name would taste as sweet, to misquote Shakespeare. We have one rose bush in the garden, it’s in a shady spot and rarely produces more than two or three blooms. But what fabulous blooms they are. 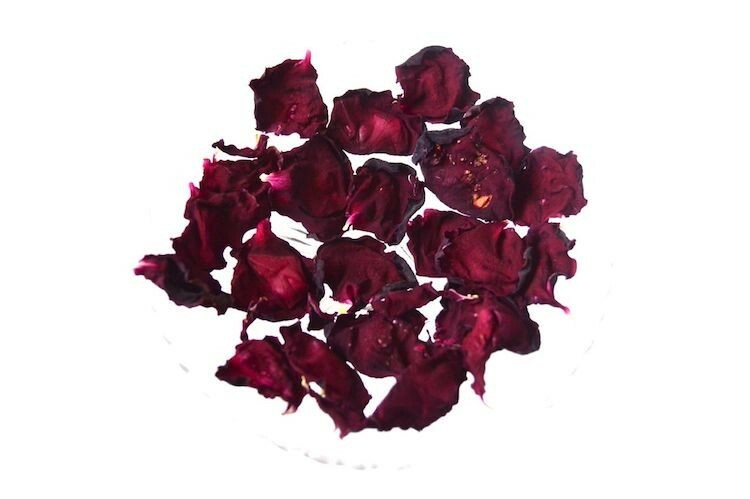 The rose is red with a heavy scent and it makes fantastic rose syrup. Now I have a dehydrator, I thought I’d have a go at drying rose petals this year. I’ve never really got on with commercially made chutneys, but homemade ones are jars of joy. I make some most years, but I didn’t get around to it last autumn and stocks have been running rather low. 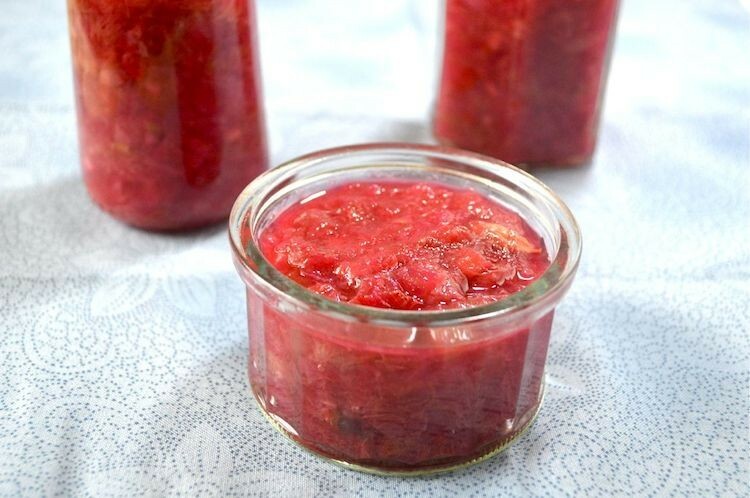 Cue rhubarb and ginger chutney. Remarkable rhubarb cake may seem a bit of a lofty claim, but this bake is so easy to make and tastes so good that I made it twice in quick succession. It’s a great way to use rhubarb, which is in season right now and it’s delightful both eaten warm as a pudding or enjoyed for afternoon tea. Back along, nearly three years ago to be exact, I hosted a six course chocolate themed dinner party for friends. These rhubarb friands with white chocolate (that’s with an a not an e) accompanied the rhubarb, rose and white chocolate ice-cream that made up the last course but one. With rhubarb already in season, this seems like a good time to finally publish the recipe. It was a friend’s birthday a couple of weeks ago and we had been invited over for lunch. This was to be followed by a walk from Respryn Bridge at Lanhydrock to Duchy Nurseries so we could indulge in a cream tea. But first a cake was in order. 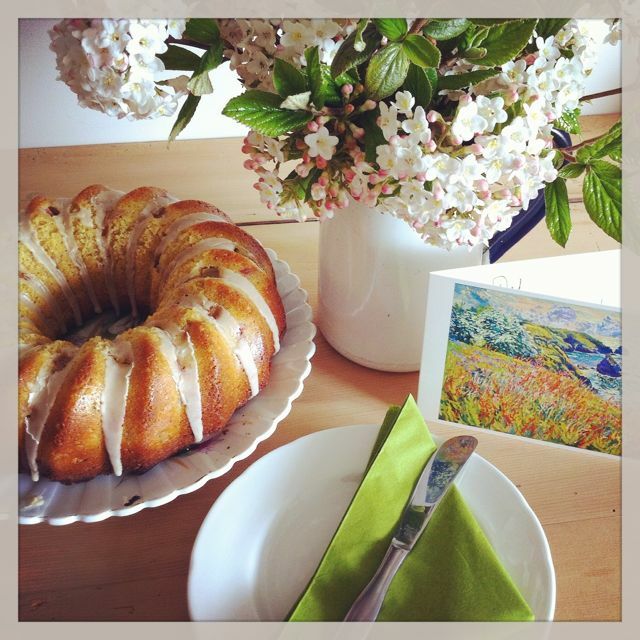 A rhubarb bundt cake with a hot ginger glaze to be precise. Waffles are such a delight. I was late to this particular way of cooking batter and didn’t get to try my first one until I visited Ghent a few years ago. There’s more to Belgium than just chocolate, I found. Waffles abounded and they were just fabulous. I finally realised what I’d been missing out on all this time. These light and crisp waffles, served with a perfumed rhubarb and rose compote and a pillowy cloud of gently scented rose cream will save you the cost of a pilgrimage to Waffleland. With Easter fast approaching and any number of Easter bakes and posts to write, time was running out for this month’s Random Recipes. Now it just so happens that RR has joined forces with the new round of AlphaBakes and it has been decided to start at the very beginning this time, with the letter A. Using my usual Eat Your Books method of selection I came out with the book Pasties by Lindsey Bareham. I must confess at this point that I felt a bit jittery. I may well come from the Land of Pasties, but my pasty making skills lean towards the imperfect end of the spectrum. I was hoping the book would fail to provide me with a suitable recipe, but in this I was foiled. A recipe for plum pasties with almond cream leapt up from the index and my heart skipped a beat. OK, no need to panic. In my usual style, I would adapt the recipe. My mother had made a recent delivery of some rhubarb from her garden (for some reason our plot seems incapable of growing any), so I would substitute that for the plums. I would add some grated white chocolate to the pastry, some orange zest to the almond cream and most importantly of all I was going to make one large pie, not six individual pasties – I really just didn’t have the time to faff around. 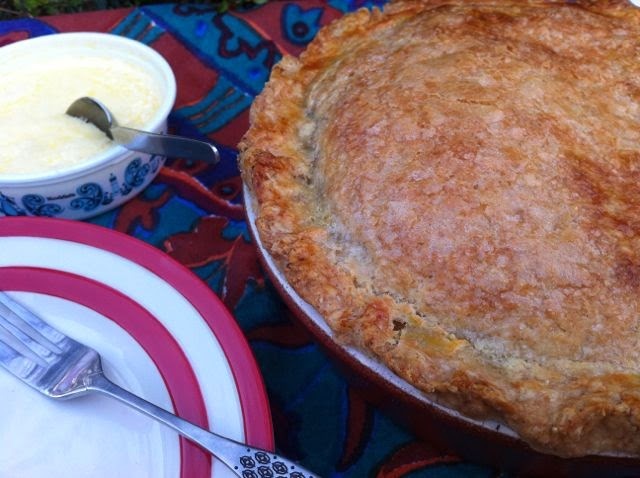 My concession to the pasty would be to crimp the edges of the pie in true pasty style – hence the name pasty pie. Cut 150g cold unsalted butter into 250g flour (half wholemeal, half white) with a knife then rubbed it between my fingers until the mixture resembled breadcrumbs. Grated in 20g white chocolate. Mixed in 2 tbsp Greek yogurt and 1 tbsp water with a knife, then brought the mixture together with my hands to form a ball. Covered with a plastic bag and placed in the fridge for 30 minutes. Creamed 100g unsalted butter with 100g cardamom (caster) sugar until light and fluffy. Beat in 1 tsp powdered orange rind (or zest of an orange). Beat in a duck egg (or large hen’s egg). Stirred in 100g ground almonds. Washed, trimmed and chopped 350g of rhubarb into smallish pieces. Divided the pastry into two portions, one slightly larger than the other. Rolled the larger portion out into a round to cover a deep 20 cm pie dish. Covered the pastry bottom with the rhubarb, then covered the rhubarb with the almond cream. Rolled out the smaller piece of pastry to cover the top of the pie. Crimped the edges together, brushed on a little beaten egg mixed with milk and sprinkled about a dessertspoon of cardamom (caster) sugar over the top. Baked at 200C for 15 minutes, then turned the oven down to 180C for a further 20 minutes until the top was nicely browned. So how did it all work out? It was pure heaven and although you couldn’t expect an angel to bring this down from on high during Lent, it sent CT and I into raptures. It was a truly indulgent dessert. I’ve not made pastry with white chocolate and yogurt before, but I will most certainly be doing it again. The rhubarb cut through the rich creamy filling and it all hung together very nicely. It just so happened that I’d recently had delivery of a bag of Rodda’s goodies which I’d won in their #crownyourpuds competition for my Chocolate Pots. So to crown my rhubarb and almond cream pasty pie, sat a dollop of Cornish clotted cream. Show me a pudding that isn’t improved by clotted cream and I’ll eat it, quipped CT – a man after my own heart. So this Rhubarb and Almond Cream Pasty Pie is my entry to the joint Random Recipes and Alphabakes challenge with A for Almond. Dom of Belleau Kitchen, Ros of The More Than Occasional Baker and Caroline of Caroline Makes have put their heads together this month and come up with this fun and clever challenge. As everything is made from scratch, I’m sending this off to Javelin Warrior for his Made with Love Mondays. The task this month from Belleau Kitchen was to select our 30th cookbook and then make the recipe from whatever was on page 30 – this is the 30th RR after all. I always approach Random Recipes with some trepidation as you just never know what you might get landed with, but off I went to Eat Your Books to find my 30th cookbook. In case you’ve missed it, I have a giveway running at the moment for a lifetime’s membership of Eat Your Books – I can’t recommend it highly enough. As it happened, I struck lucky and my 30th book was Nigella Lawson’s How to be a Domestic Goddess. For many years, this was the only book on my bookshelf dedicated to baking, so I know it well. Now that I have many others, I don’t use it as often; I was glad to be persuaded to renew my acquaintance. It also meant, that with any luck I might be able to enter this into Forever Nigella. 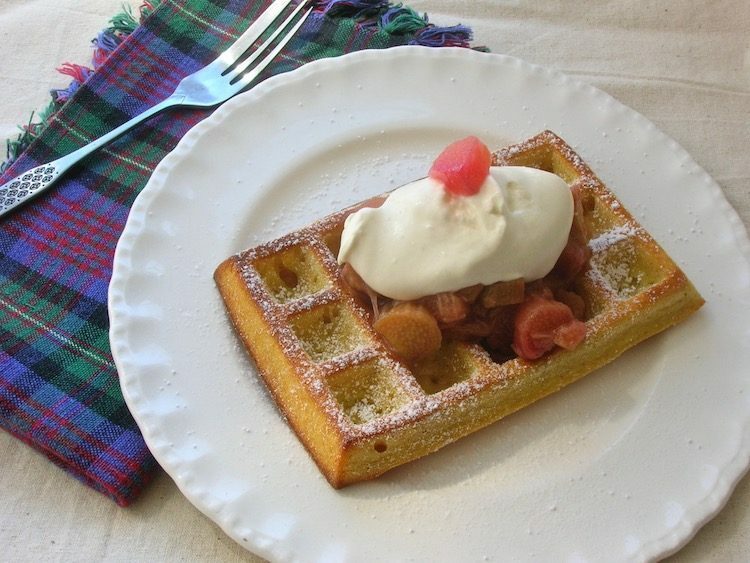 The next task was to go and find the book and turn to page 30 – Rhubarb Cornmeal Cake. Now this couldn’t have been more opportune. I made this cake once before, many years ago, so I already knew it was a good one. I was shortly to be baking for Liskeard’s first pop-up cafe and was wondering what gluten-free bake I could include. With a little tweaking, namely substituting the wheat flour for buckwheat, this would do very nicely, I thought. The addition of white chocolate could only improve things and would allow it to appear on Chocolate Log Blog. I’ve already established that rose and rhubarb make for a fine combination, so I wanted to include some rose syrup here for added interest. Washed and trimmed the rhubarb, cutting it into ½ cm slices. Placed in a bowl and covered with 100g of cardamom sugar (caster) to extract some of the juice. Added 4 tbsp rose syrup. Melted 50g white chocolate (G&B) in a bowl over hot water. Creamed 125g unsalted butter with 150g cardamom sugar (caster) until light and fluffy. Beat in the cooled chocolate. Beat in 2 large duck eggs, one at a time. Sifted in 150g buckwheat flour, 155g fine cornmeal, 1 tsp bicarbonate of soda, ¼ tsp salt and 1 tsp ground cinnamon. Stirred in 250g natural yogurt alternately with the flour until just combined. Gently stirred in the rhubarb and juice. Poured into a 23cm cake mould and baked at 180° C for about 50 minutes until the top was well risen and springy to the touch. Covered with tin foil after the first 30 minutes to prevent the top burning. Left to cool for 20 minutes, then turned out onto a wire rack to cool completely. 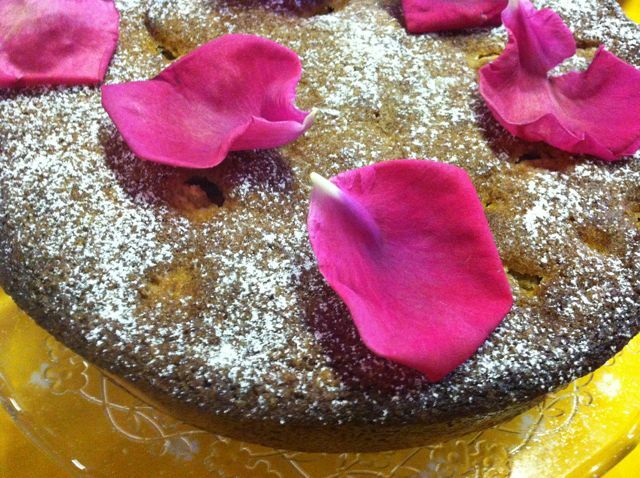 Dusted with icing sugar and scattered with rose petals. The bake came an honourable second behind the most popular one, the chocolate cake. Sadly, I didn’t get to try any, but I had very good feedback and all of it disappeared. The very first person to try anything was gluten intolerant, so she was delighted to have something tasty she could eat. I am entering this into Random Recipes, an excellent if somewhat adrenalin-inducing monthly challenge run by Dashing Dom of Belleau Kitchen. And I did indeed strike lucky with Forever Nigella, a monthly challenge from Sarah of Maison Cupcake. This month Victoria of A Kick at the Pantry Door is hosting and luckily for me, she has chosen Party Party. I think this is a fitting contribution to any celebration. It’s been a while since I entered Made with Love Mondays, a weekly challenge from Javelin Warrior, whereby everything must be made from scratch. As I used rose syrup in the cake, made with my own roses, I am entering this into Cooking with Herbs with Karen of Lavender and Lovage.